Somebody’s Daughter is the story of nineteen-year-old Sarah Thorson, who was adopted as a baby by a Lutheran couple in the Midwest. 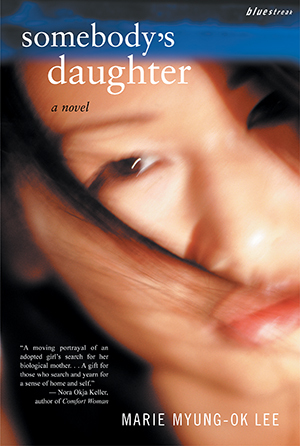 After dropping out of college, she decides to study in Korea and becomes more and more intrigued by her Korean heritage, eventually embarking on a crusade to find her birth mother. Paralleling Sarah’s story is that of Kyung-sook, who was forced by difficult circumstances to let her baby be swept away from her immediately after birth, but who has always longed for her lost child.